Although everyone tells you that your college years will be the best years of your life, it’s fair to say that college can also be super stressful. You have classes to attend, you have grades to be met, and you have exams to pass. Yes, and that’s before you take into account everything else, like being able to pay for food, being able to wake up on time, and being where you need to be every single day. College is hard, and this student felt this herself on the day of her first ever college exam. To truly understand this story, we need to learn a little more about the student in question. 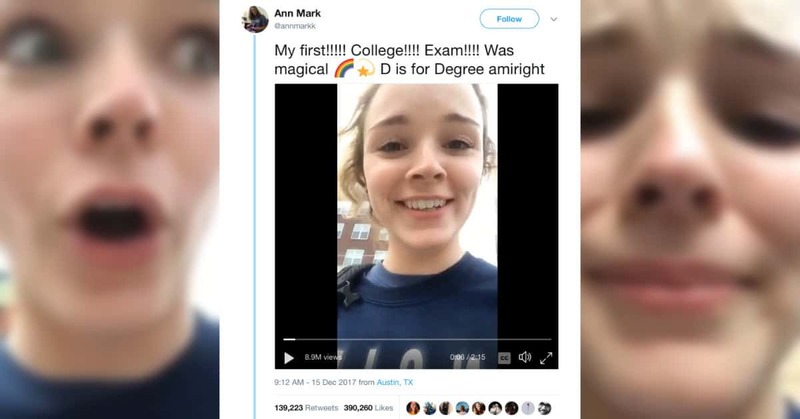 Ann Mark is a student at the University of Texas at Austin, and in December 2017 she was getting herself for her first college exam for World Cinema History. Sure, she hadn’t been to class in over a month, but she still felt prepared. She had revised for the exam, and she felt confident that she would be able to pass. Unfortunately, things didn’t quite end up that way. To start off her whole ordeal, Ann found herself running behind schedule. She had just 15 minutes to get to the final before the doors closed, and she wouldn’t be allowed to sit the exam. Thankfully, she gets to the classroom on time… before realizing that she didn’t have a blue book. Because of this, she had to get back up and run to the store where she could buy two blue books, just in time to start the exam! Ann made her way to the front row of the classroom and text her friend, who was sitting in the third row. The only problem was that her friend was sat in the third row, but the third row in a completely different room. As Ann looked around, she realized that she had no idea who the people around her were. Ann immediately jumped up from her chair and tried to find the real location of her exam. After getting lost and running around campus, she finally found the room. Worried and upset that she had missed the deadline, she ran full force into the open door – or what she thought was an empty door. Instead, Ann had ran straight into a window, in front of her whole class. She was incredibly embarrassed, but put her head down and wrote her exam. Later, she videoed her ordeal, and it instantly became a viral sensation. College finals getting you down? Well, just be thankful you’re not this lady. It could be worse! Is getting a master’s degree really always necessary?